The series was quickly discontinued, presumably after poor sales, and three of the four books are undoubtedly very rare. 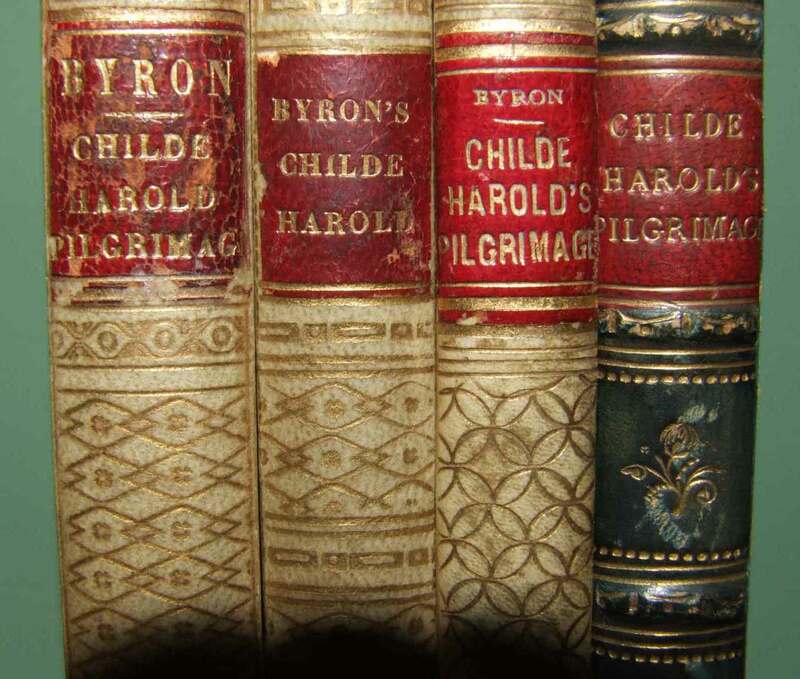 The first book in the series though, an edition of Byron’s ‘Childe Harold’s pilgrimage’ seems to be a little less rare and I have now seen 6 copies of it in total. The puzzling thing is that all six copies are different. This remember was a series of gift books, described by Todd & Bowden as ‘each a luxurious bibelot’ and selling for about 3 times the cost of an ordinary Tauchnitz. It seems scarcely possible that it can have followed the usual Tauchnitz practice of being sold in paperback form, for the purchaser to have privately bound. Yet the evidence of the books certainly suggests that there was no uniformity at all in the binding. Two of the copies I have seen are in what appears to be the standard series binding, in cloth with blindstamped borders, a gilt title medallion on the front cover, gilt title on the spine and all page edges in gilt. Even these two copies though differ in the colour of the cloth, the size of the binding, the colour of the end-papers, and also in that one has the half-title bound in before the frontispiece and title page, while the other has it after. Three copies are bound in vellum, each with gilt decoration, a red spine title label and marbled end-papers. But again they differ in multiple ways. The gilt decoration is different, the style of the spine title is different, as is the wording, the end-papers each have a different pattern, one has page edges in gilt and the other two in red (different shades), each has a different style of bound-in bookmark. Again there is no consistency in the order in which pages are bound – two have the half-title after the title page, one is before. Finally, one copy is bound in blue leather over marbled boards, with both end-papers and page edges marbled in a consistent style. There are raised bands on the spine, with gilt decoration and a red title label, and in this copy the half-title is bound first. In short, between them the six copies display almost every variation of binding style, within the range of prestige bindings of the time. So were they all bound by Tauchnitz and sold as bound editions, or did Tauchnitz just supply the pages, in paperback or semi-bound form, to other binders, or directly to bookshops? Were purchasers able to specify the binding they wanted from a range of different styles? I have no answer to these questions, but one clue may be in the similarity of the vellum-bound copies to the range of Italian-bound extra-illustrated editions of other Tauchnitz books. These were souvenir editions sold to tourists in Italy, usually books with an Italian theme, as Childe Harold is in part. 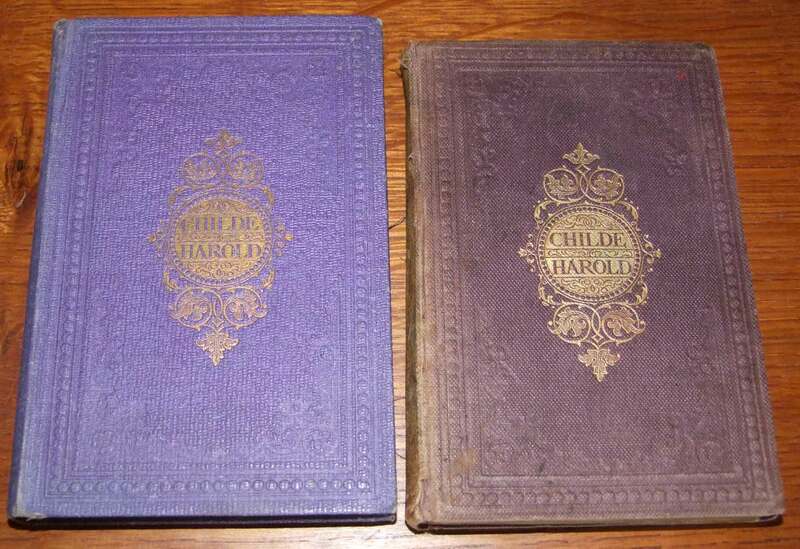 Although the copies of Childe Harold in this form have no photographs bound in, they appear to me likely to come from the same source, in other words Italian binders, possibly in Rome or in Florence. These bindings though would be considerably later than the original 1862 publishing date, more likely in the 1870s or 1880s. As it happens two of the copies have references to Rome written in on the end-papers and one is dated 1881. Although these could have been written in later, they are at least potentially consistent with the idea of Italian bindings from the 1870s or 1880s. Is it then possible that Tauchnitz supplied pages to one or more Italian binders, who bound them up in this way for sale to the tourist trade, or perhaps supplied pages to a single Italian entrepreneur who used various different bookbinders? Did Tauchnitz perhaps have an unsold stock of pages, ten years or more after initial printing, with this being a convenient way to dispose of them, or did it reprint them specially for this purpose? Perhaps it had printed far too many copies of this first book in the series, before it became evident that sales were disappointing, whereas the later books were produced with a much shorter print run. Or perhaps only this book was seen as relevant to the Italian tourist trade, and spare stock of the later titles was destroyed (although the fourth book, Romeo and Juliet of course also has an Italian theme).